DEL MAR — Del Mar residents may once again notice the wayside horns at the Coast Boulevard crossing are tooting a little bit longer. 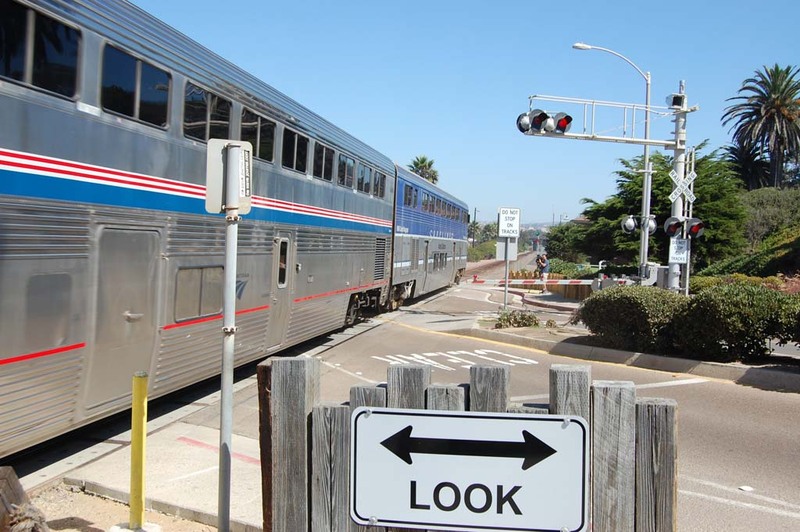 The Federal Railroad Administration, which regulates the systems, planned to increase the length of the horn sound by five seconds beginning Aug. 15. This is the second five-second increase in the length of the toot since the wayside horns were installed almost two years ago. To ensure the devices sound for the entire time the lead locomotive is traveling through the crossing, the FRA increased the length of the horn noise from a minimum of 15 seconds to 20 seconds in mid-March. Residents spent years trying to find a solution to increased train noise in the small beach city. The wayside horn system was the most economically feasible. Stationary horns are permanently mounted at the city’s only train crossing. Quiet zone indicators — poles with red Xs that let engineers know the wayside horn system is in place and working — are installed west of Seagrove Park, west of the railroad tracks and at the crossing. The system mimics the sound of a horn when a train approaches. It must sound at 92 decibels 100 feet from the center line when a train is 1,300 feet from the crossing. Engineers can still manually sound their horns, especially if pedestrians are in the crossing. Funding for the $450,000 project came from residents and North County Transit District. The volume from the directionally angled speakers will not change.